Like our startups clients and the Harvard Business Review ¹, we believe that iteration leads to innovation. As with great companies and ideas, great brands require trial and error, market testing and continuous evolution over time. Yes, consistency is important in creating a great brand, but you can be consistent and still evolve and grow. 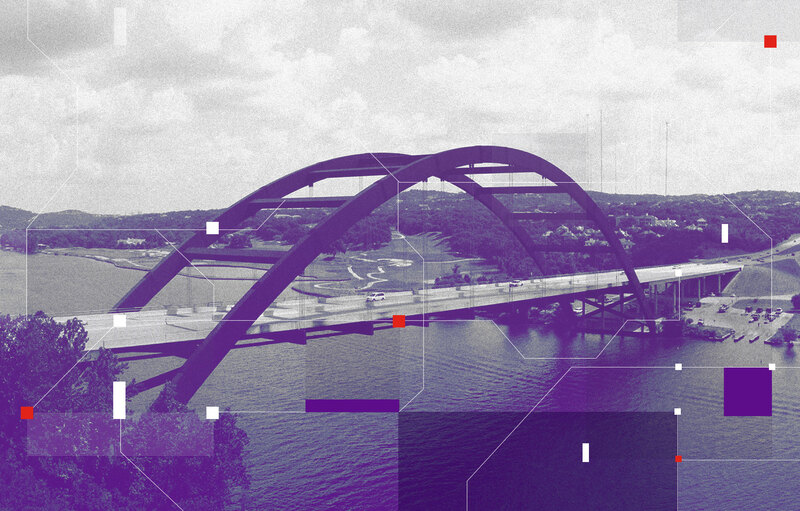 Because we believe that brands are living, breathing entities and creative iteration leads to brand innovation, we knew there had to be a better approach for creative and brand development than the traditional waterfall development process. With that in mind, we began offering an iterative process to select clients and projects that fit the mindset and organizational structure to maximize the fluid nature of the process. While not for everyone, what we’ve found in the results of this approach is a remedy for the chaos of constant change that some of our clients face as they attempt to push projects forward in pace with shifts in their business. Our version of the iterative process is built around two-week sprints that provide focus for quick strategic, visual and messaging explorations while allowing for flexibility in long-term objectives. This process is built on collaboration, with frequent reviews and working meetings to facilitate conversation and participation from all stakeholders in the project. At the beginning of each sprint, we sit down with our client to identify the focus and goals for the two-week period, as well as sprint milestones and checkpoints. Progress sharing does not include formal presentations – time we save for project deliverables – and our checkpoints are structured to elicit decisions across teams. The goal of this process is keep projects moving forward, allowing us to create more work quickly and without getting bogged down in milestone and scope discussions as the client’s business needs naturally shift. 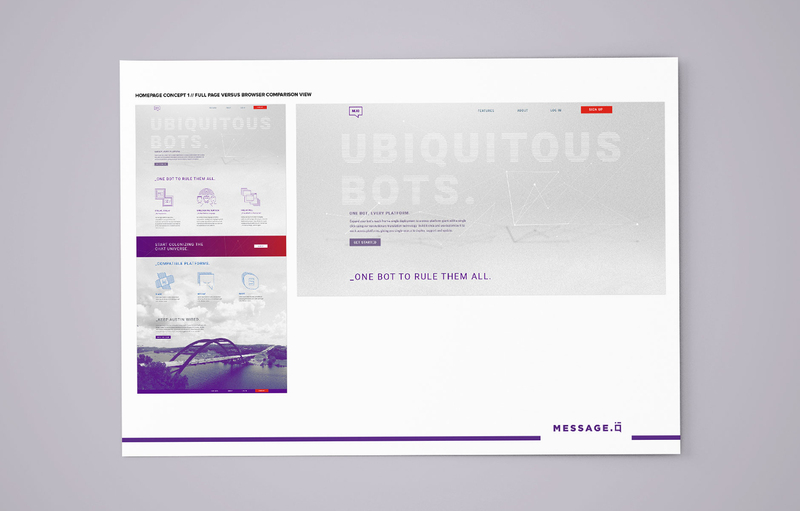 Below are a few examples of options and ideas shared with Message.io, our most recent iterative client. 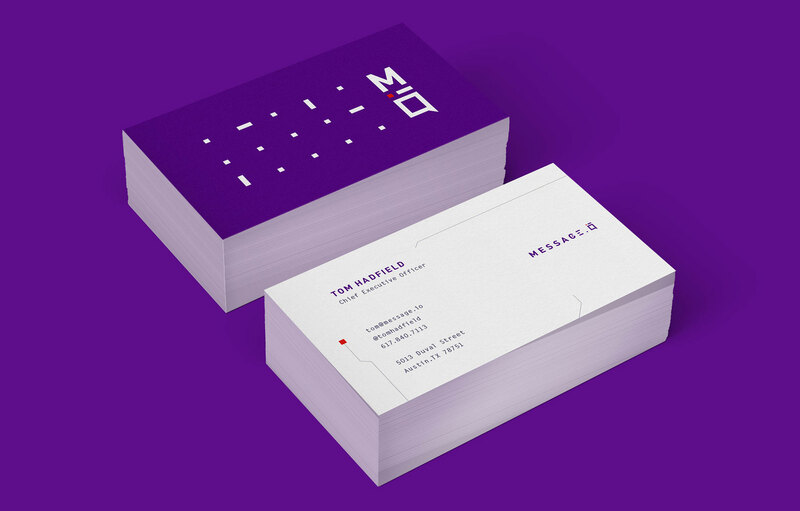 We worked with their team over the course of several sprints to create the brand identity, positioning and messaging, website design, user interface explorations, business cards, emails and much more. 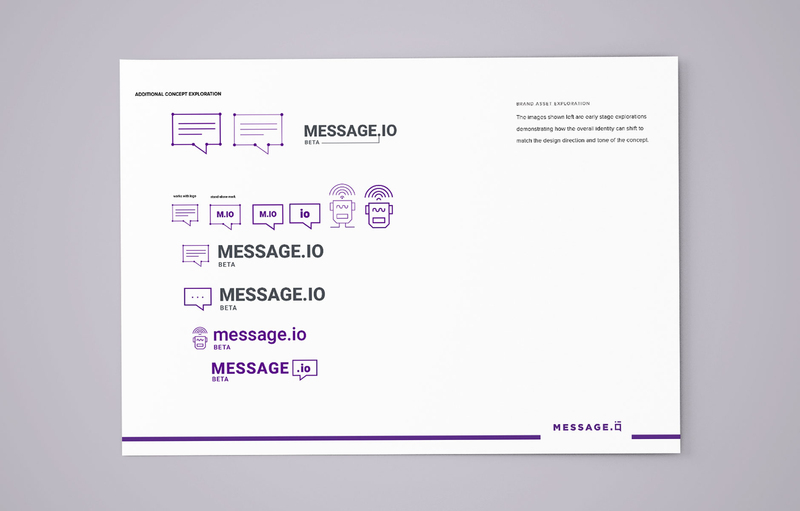 The Message.io team was working towards an accelerated product launch for an event, so we worked with their teams to quickly align on the goals and vision for unveiling the brand. With those objectives and aspirations in place, we were off to the races exploring options for what the brand could be. 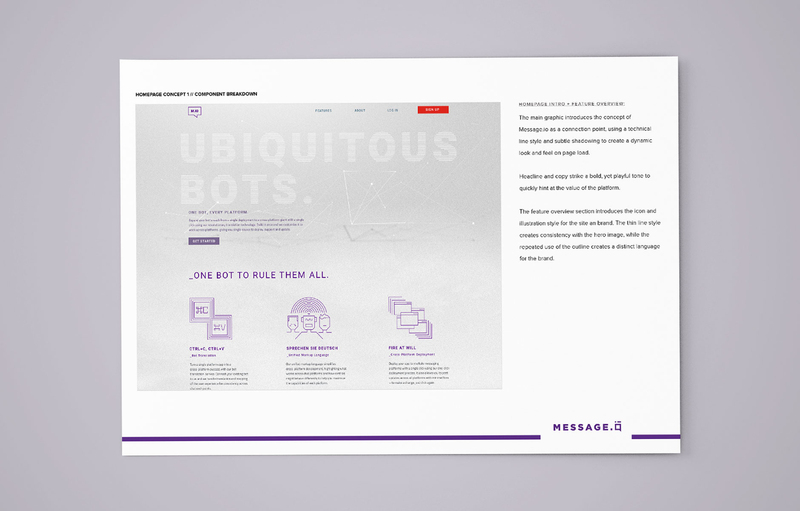 With the accelerated pace of development, the Message.io team was exposed early and often to the elements we were creating, allowing for incremental selections and decisions to be made versus a typical formal reveal. Because of this, we were able to quickly refine and move on to other materials for the brand. Message.io was also able to share these initial explorations with other partners and customers to get feedback, allowing them to gut check the work before going to market. 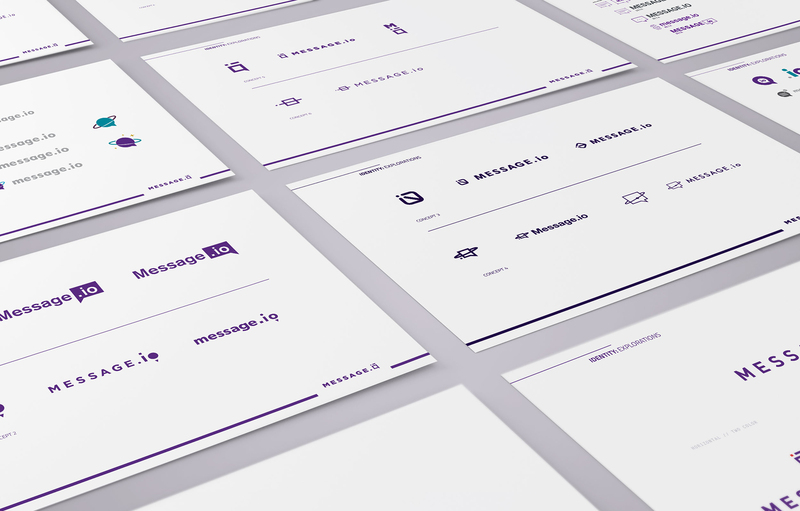 You can see the final results of our partnership with Message.io on our project page or on the live site at message.io. The iterative process works well when the teams are able to communicate openly and collaboratively to make quick decisions and move forward. It is not a perfect fit for everyone, especially those clients that need more time to make decisions. But when it works well, it is a powerful way to quickly and efficiently build a brand.